Max. 40 characters per line. Only A-Z, 0-9, space and line. 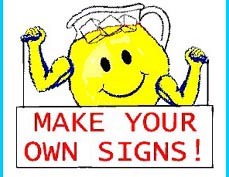 Welcome to the Koolsign.com FREE sign generator. You can put your own custom message on any of the templates above. CLICK ON THE PAGE NUMBERS 1-6 TO SEE MORE TEMPLATES. Start by selecting a template. Then type your text in the 4 lines to the left (you can leave lines 2,3 and 4 blank if you wish), then if you would like to change the font or adjust the text, use the TOOLS on the left to select font, font color, size position, spacing, rotation and image size. The default layout usually works best without any design changes. After you have selected a template and set your text, then click CREATE. 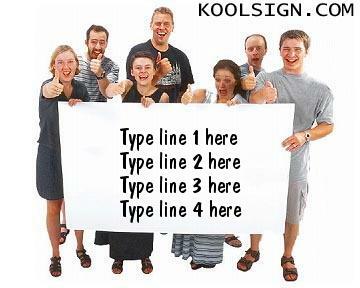 Your image will appear below along with the link codes to cut and paste to your site. You can also send the image INSTANTLY to friends with the email form below! Have FUN!